Joanne Santini and her team from the UCL Department of Structural & Molecular Biology, in cooperation with Imperial College London, have developed a handheld, low-cost sensor for detecting arsenic in water supplies. According to the World Health Organization, more than 140 million people across 70 countries drink water that contains arsenic above safe levels, highlighting the potential global impact of the development. In 2016 and 2017, UCL Innovation & Enterprise helped Jo and her team secure knowledge exchange funding. "It enabled me to visit arsenic affected areas in Bangladesh and engage directly with people in villages affected," explained Jo. "It made a big difference." Researchers developed and tested a method of sample collection that allowed them to take samples from village wells and transport them back to UCL for elemental analysis. "This was important as it allowed us to accurately assess the field performance of the biosensors," explained Jo. A London-based technology consultancy, Bio Nano Consulting, is currently conducting further field tests with a view to developing the sensor for public use. Meanwhile, UCL’s research into contaminated water in Bangladesh continues to broaden. "My ultimate goal is to ensure that people in countries like Bangladesh have toxin (arsenic) and pathogen free drinking water because this is a basic human right," explains Jo. 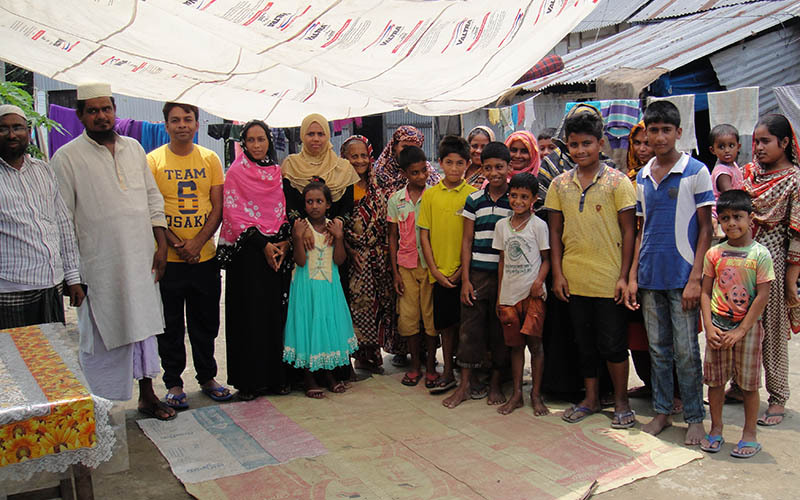 "Funding from UCL Innovation & Enterprise has generated an ongoing, helpful discussion about developing and expanding the project to look at other aspects of the water issues in Bangladesh." The funding enabled researchers to test the hypothesis that hand pumps are a reservoir of Faecal Indicator Bacteria (FIB). Researchers sampled the handle, spout, piston and seal from 19 wells in Araihazar, Bangladesh and identified that the spout and seal were indeed reservoirs of FIB. These findings led to their recommendation that well spouts be regularly cleaned, including the removal of precipitated deposits, and that the seals be regularly changed. It's envisaged that one or both of these interventions will reduce the numbers of FIB in drinking water, thereby reducing the burden of diarrhoeal disease in Bangladesh. "New opportunities have emerged because of the breadth and depth of what innovation and enterprise can offer," said Jo. "It was an eye opening, inspirational experience, particularly working with people, face to face who are supportive and want to help." Information about the above research is included in a recent academic paper written by Jo Santini’s team and published in the Journal of Water and Health. As a consequence of her ongoing research into this issue, Jo was named as a finalist in the BBSRC Innovator of the Year Award 2017. Developments with the arsenic sensor were also featured as a case study in the 2018 summer edition of the BBSRC Business Magazine.